The outside of The Herbal Cure still looks probably much the way it has since it was built in 1927, minus the giant red railroad trolley in the front, which makes it look like a movie set for a spaghetti western. The shop is in what was formerly a lumber yard and later a car lot, and the parking lot and back property dwarf the small building on its edge. I used to shop there when they sold another type of wood, and the owners have done a good job of turning the office into a southwestern-styled dispensary. There are two waiting rooms — one in the front of the store and another after you have been led back through the security doors. The front room is long and narrow, with a corner fireplace, unfinished wood walls and roof timbers. After my paperwork was checked, I got a quick tour around of the cozy space. The bud bar is in a nook to the right as you enter, along with small rooms for patient consultations and storing clones. The rest of the dispensary is taken up by a huge wooden dinner table and, beyond that, a patient lounge. The poofy couches were comfortable, and there was plenty of reading material and a flat screen TV on the wall– which was good, because I sat for nearly twenty minutes waiting on the chatty customer in front of me to finish up. Jula Burnham, who owns the shop with her husband Brandon, said they pride themselves on having a place patients can hang out, and clearly this guy wanted to do just that. To his credit, I don’t think he realized I was waiting in line behind him. When he leaned around the corner from the bud bar after yakking on about his own garden to check the score on the Steelers game and saw me sitting on the couch, he sped up his transaction. 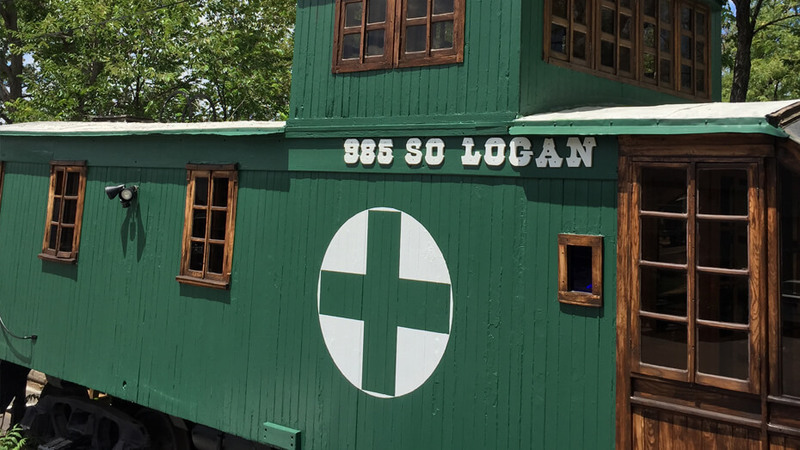 Once he finished, I was finally called over to the bud bar, where Brandon Burnham gave me the rundown of what they had in stock, starting with the edibles, topical lotions and concentrates stored in a custom wood cabinet. Herb is kept behind the shelf in glass jars on a wooden book case along the wood-paneled wall. The Herbal Cure reminded me of a hunting camp, but with jars of ganja and kokopelli figures hung on the walls instead of dead elk heads. Brandon was friendly and I realized later that I spent nearly as much time at the counter chatting as the guy in front of me had spent — though nobody was waiting behind me. Herb is broken down into three categories and Brandon had no problem with me working my way through a dozen jars one sniff at a time. Top shelf jars sell at $50 an eighth, middle shelf at $40 and bottom shelf at $35, and all eighths are weighed out at four grams. Brandon told me I would notice a difference between their top shelf and their middle shelf, but the only difference I saw for several of the strains was the price. I did see some good cuts, like the Juicy Fruit, Rough Neck, and Banana Kush. But some of the jars, like the Sour Diesel and Bubba Kush, were down to shake and clearly weren’t of the same quality as the other strains. Jula Burnham told me later that some of the jars were likely low and shaky because it was the end of the day, but she also admitted they have struggled with their price structure in the past. As the market gets more competitive and shops are starting to offer similar quality “top shelf” meds for less, Jula says they plan to drop their prices to $45 per-eighth — probably this summer, in order to coincide with a larger output of new genetics they are currently growing out. Page down to see what William Breathes took home this week. The wax had the same orange color as ISS buds, with a true pine sap smell and consistency that melted like beeswax on my fingertips. Dabbed on an oil plate, the wax sputtered a little but mostly bubbled away into a cloud of thick smoke. The oil had a fresh, cedar taste to it but lacked any strong skunky sensation I hoped for considering its origin. But the purely cerebral sativa high, cotton mouth and munchies that took over within twenty minutes was very much Island Sweet Skunk. As powerful as the buzz was for a solid hour and a half, it quickly petered out at the two-hour mark. I got roughly four good dabs on an oil-specific pipe, but I would think most patients could stretch the $30 half-gram much further. The strain comes from Centennial Seeds, one of Colorado’s first cannabis seed companies, and they aren’t giving up the lineage. However, the budtender told me he thought this strain had hints of something from the chem family. It’s the first I’ve seen of this strain and I hope to see a lot more. The strongest smell out of the jar was a sweet haze, like Super Silver Haze minus the dank muskiness. Very fluffy strain, even without the excessive fan leaves left on the bud. It had tall, fat calyxes that were coated in long tomato-orange hairs. The trichomes were equally as lengthy and they gave the bud a fuzzy appearance. It looked nice, but with the sugar leaves it burned rough in the bubbler. It had a mild skunky taste with a very light hazy finish that I hope they can bring out in future crops.